JJ: 40 years old, married with 5 children. JJ: Yes! Played just about every sport growing up. Organized and good old fashion pick up games in the backyard, street, playground, etc. Also, enjoyed bike riding and skateboarding. I played football/wrestled in high school and played defensive end for the West Chester University of PA Golden Rams football team. JJ: I didn’t change my training specifically for the GORUCK. I’ve been training since I was 13/14 years old. 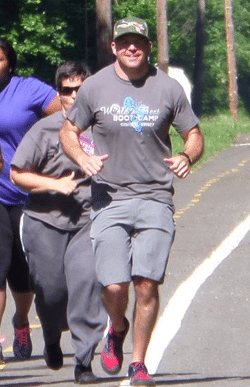 JJ: The event was the NYC 9/11 Memorial GORUCK Challenge. Over 300 people were registered so they split the group into 4 different starting points. I was in Group A and our start point was the Bronx. Group A was split again into 3 teams and I was on Team Alpha (22 team members). All 3 teams completed the Welcome Party (basically a 3hr PT session) together and then split up ultimately meeting up again at the World Trade Center Memorial. We started at 9pm on Friday (9/12) and arrived at the WTC Memorial on Saturday (9/13) at 10am. We rucked approximately 14 miles (as the crow flies) and were tasked to carry several items including a 500lb sandbag and a team weight of a sledge hammer and halligan tool in honor of the 343 firefighters who sacrificed there lives on 9/11. We would be given a certain time to make a destination and if we didn’t make our time hack we would PT (usually flutter kicks while holding our rucks over our heads). Our Cadre’s name was SurfHog and as you can imagine by his name he was fond of telling us how comfortable he was in the water and made sure we got to experience the Hudson River a couple of times. JJ: Log rolls…lol. In all seriousness, I would recommend actually rucking and getting used to carrying a backpack with approximately 35-40lbs on your back for 12-15hrs. The ruck can never touch the ground so you need to become comfortable with the ruck. I didn’t do this and should have. 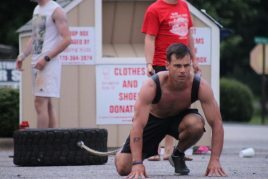 SGPT: Any tips for up and coming athletes that want to do the GORUCK? JJ: Train. Incorporate some strength training and conditioning in your training but most importantly train as you are going to “play”. As I said above get used to rucking and do some PT while wearing your ruck. Test all your gear out before the event. Nothing is worse then getting to the event and realizing your hydration system doesn’t work or the boots you chose don’t drain well (you will get wet). If you are new to rucking I would recommend starting with only a brick or two and work your way up to the full weight. Challenge yourself mentally too. Complete a difficult workout such as “Murph” (1 mile run, 100 pull ups, 200 push ups, 300 squats, 1 mile run for time) once in awhile. The event will be just as taxing (if not more) mentally then it will be physically. If you are not sure what to do get a coach. 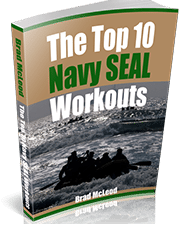 Subscribe to the SealgrinderPT Mental Edge Newsletter, buy one of their ebooks, etc. SGPT: What boots did you wear? JJ: I wore the Inov-8 Roclite 286 GTX Boots . They are a lightweight, waterproof trail running shoe. I wore these for the first GORUCK I did in April and they served me well at both events. I contemplated wearing the Under Armour Valsetz but wasn’t sure how’d they drain and didn’t test them before the event so I went with what I knew would work. SGPT: Did you use Bodyglide anti-chafe balm , compression shorts or double socks? JJ: I didn’t use any of those but would highly recommend compression shorts and body glide. They are on my list for my next event. Luckily for me a team member had some Vasoline at this event because chaffing is definitely an issue. SGPT: Which backpack did you use? JJ: For this event I used the GORUCK GR1. For the event in April I used the 5.11 Tactical Rush 12 Backpack . Both packs served me well and I would be comfortable recommending either. SGPT: Many thanks for the interview Jay! JJ: Thank you Brad! And I look forward to completing a 20X Challenge in 2015! Excellent interview – I read all of these – very helpful in terms of reminding me what I need to work on and be ready for. Jay Bro! Awesome to see you did another one after your recent AC experience! Good work brother. Thanks Mike! Hope all is well and you guys at the Hackettstown Barbell Club are getting some work in! Are there any cheaper packs that are comparable to the gr1 or is the gr1 the way to go? Nice Job Jay, well said, it was an excellent time and look forward to our next event. Thanks Mike! Great work at the event and looking forward to many more events and some training together!